The scientists found the FMRP protein (in red) binds to a region of the ribosome—between two ribosomal subunits—likely to be critical for the proper production of many proteins in the brain responsible for normal cognitive function. Scientists studying the most common form of inherited mental disability—a genetic disease called “Fragile X syndrome”—have uncovered new details about the cellular processes responsible for the condition that could lead to the development of therapies to restore some of the capabilities lost in affected individuals. In a paper that will be published in the May 8 Molecular Cell, but is being made available this week in the early online edition of the journal, the researchers show how the fragile X mental retardation protein, or FMRP, which is in short supply in individuals with Fragile X, affects the protein-making structures of cells in the brain to cause the disease. Researchers previously knew that in the absence of FMRP, protein-synthesizing structures called ribosomes translated some of the genetic instructions to produce proteins in the brain incorrectly, but exactly how this translation went awry was a mystery. More precisely, the researchers found that the protein binds to a region of the ribosome—between two ribosomal subunits—likely to be critical for the proper production of many proteins in the brain responsible for normal cognitive function. 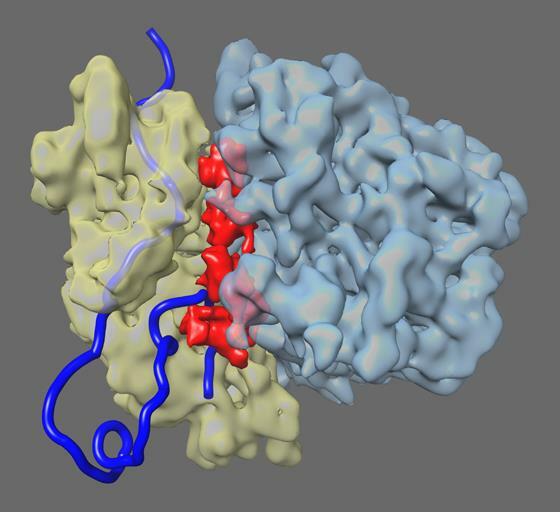 Using laboratory fruit flies, which have FMRP and ribosomes similar to those in humans, the scientists mapped the primary binding site of FMRP on the ribosome. With that information, medical researchers might be able to identify potential drugs that target those areas of the ribosome to help restore normal protein production in individuals with Fragile X. “Similar to FMRP, it is possible that there are other proteins in the cell that bind directly to the ribosome as well to regulate gene expression,” said Joseph. Other scientists involved in the study were senior author Rajendra Agrawal, a principal investigator at the Wadsworth Center of the New York State Department of Health and the State University of New York at Albany; Eileen Chen and Xinying Shi of UC San Diego; and Manjuli Sharma at the Wadsworth Center. The study was funded by grants from the National Institutes of Health (R01 GM065265 and R01 GM61576).